Latest Update: The closing date of the 2018/2019 LAUTECH JUPEB application form has been extended. The new closing date of the application is now Thursday, October 4, 2018 while the screening exercise will hold as indicated on applicants' slip. While this information does not affect the screening exercise for those who had applied prior to September 17, 2018, freshly interested applicants are to kindly use the opportunity of this extension . 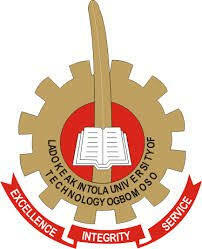 Applications are invited from suitably qualified candidates for admission into the Ladoke Akintola University of Technology (LAUTECH) one (1) year Joint Universities Preliminary Examinations Board (JUPEB) programme. LAUTECH JUPEB Admission Duration & Subject Combinations. The programme is expected to run for One (1) Academic Session. During the Programme, Candidates will have the opportunity to write Joint Universities Preliminary Examinations Board (JUPEB). ‘A’ Level Subjects. Candidates will be prepared for the above Examination in the following subject combinations. Candidates should possess five O/Level credit passes in WAEC, NECO, GCE or NABTEB at not more than two sittings from English Language, Mathematics, Physics, Chemistry, Biology/Agric. Science, Economics, Geography, Financial Accounting and Business Studies. How to Apply for LAUTECH JUPEB Admission. All Fees are payable via the LAUTECH InterSwitch Payment Integration Platform. Note that a bank transaction charge of =N=300:00 per transaction apply for all InterSwitch payments. Go to http://jupeb.lautech.edu.ng/and Click on “here to apply” link at the top of this web page. You should ONLY do this after you MUST have read and understood all the instructions on this site. The Email Address supplied has to be unique and valid, and will serve as your Registration ID to make payment. After successfully registering an account, you are to visit the Email address you supplied, to retrieve your PASSCODE. This PASSCODE will enable you access the payment system. This can be accessed through the “returning aplicant” link at the top of this page. After registering an account, please note, you then fall into the category of “Returning Applicant”, and you should always use the “Returning Applicant Login” at the top of this web page. As a “Returning Applicant”, you can make payment (by clicking on “Click here to Pay for your Application Form with a Created Email Address”. You are expected to supply the Email Address registered earlier and the PASSCODE sent to you); you can obtain a Application Form Number(this must be after a successful Application Form Payment); and you can also complete the application process. After a successful payment, in order to get an Application Form Number, click on “Click here to get a Form Number”. You are expected to supply the Email Address registered earlier and the PASSCODE sent to you. Your Application Form Number will be e-mailed to the supplied email address, and also shown on the screen. To complete the Application Form, you need to have gotten an Application Form number. You are to login with your Application Form number and the password earlier created. After you successfully fill the application form, and submit it, an Examination venue will be alloted to you. Please make sure you print this slip. Please note, after submission of your Application Form, you will be unable to change the Passport Photograph uploaded. Hence confirm the passport uploaded is yours before you attempt to submit your form. The closing date for the submission of Application Form is Monday, October 4th, 2018. Each candidate must ensure that the Acknowledgement slip bearing his/her passport photograph is downloaded and printed as an evidence of successful submission of form. Please note that late completion/submission of forms will not be entertained. Screening Exercise will hold as indicated on applicants’ slip.